Deep in the wilderness in their secluded cabin in the woods a lumberjack and an artist who keeps shop found heaven in the love held between them. Then enters a living nightmare. Just like that their world is torn apart, their love however never will be. Heaven on Earth is interrupted when a crazed cult decide they want Mandy (Andrea Riseborough) for their own. The violent act they commit will be paid back to them tenfold. “The darker the whore, the brighter the flame” but if you take this lumberjack’s love it’ll drive him insane. Second generation director Panos Cosmatos follows in his action film father’s footsteps creating a mad action masterpiece in arthouse cinematic lighting. George P. Cosmatos created one of the most beloved westerns outside of the spaghetti western era with 1993’s Tombstone starring Kurt Russell. He also did two legendary 80’s action movies starring Sylvester Stallone in 1986’s Cobra and the final 80’s installment of Rambo, First Blood Part II. Like father, like son. 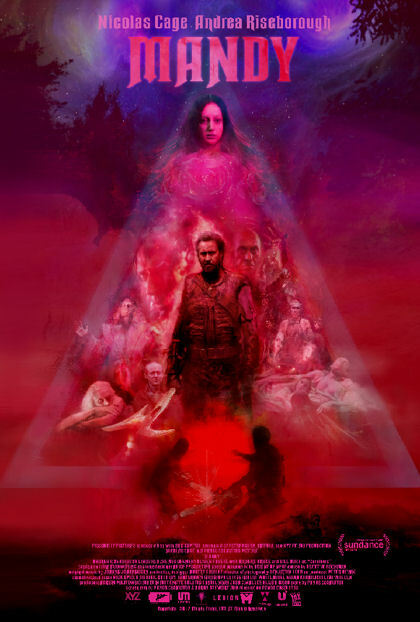 Panos Cosmatos’ muse is another famous Hollywood leading man in Nicholas Cage who absolutely knocks it out of the park. Red Miller (Nicholas Cage) and Mandy Bloom capture an on screen love more visceral and pedestrian than any Rom-Com Hollywood’s produced. Andrea Riseborough touched my heart as Mandy Bloom in a simple but so realistically flawed performance. Nicholas Cage is her rock without the need to take the spotlight which he does so well. Nicholas Cage’s break from sanity as Red Miller is some of the eccentric actor’s best work. The second half is a hallucination of bright colors and violent acts. It’s a 1970’s giallo film on 80’s revenge slasher steroids. The unbearable build to this point plays brilliantly off the fantastic payoff. Mandy touched me in death by building a realistic love, making revenge that much more bittersweet.